Mike and Anne Howard have been on the "World's Longest Honeymoon," traveling over four years to 40+ countries. And they aren't done yet. They just explored their seventh continent, which not only makes their honeymoon the greatest in length, but also in breadth. An achievement of love and travel...finally, a world record we can get behind! Most world records sound terrifying, painful, or just plain ridiculous. Until this. 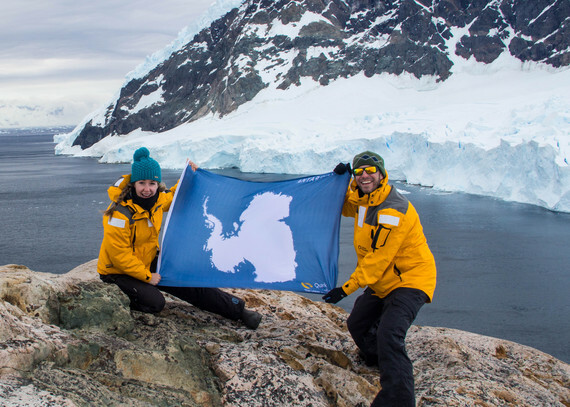 Upon their recent return from Antarctica, I caught up with Mike and Anne to chat about how the HoneyTrek began, their adventures from the frozen continent, and where on Earth they are headed next. What made you decide to take a honeymoon around the world? While dreaming about our honeymoon, the list of destinations was running off the page. Then we thought, what if we could go to all of these places? We've got some money saved, we're healthy, we don't have kids...will there ever be a better time to travel than now?" So we quit our jobs, rented out our apartment, and started our around-the-world honeymoon. 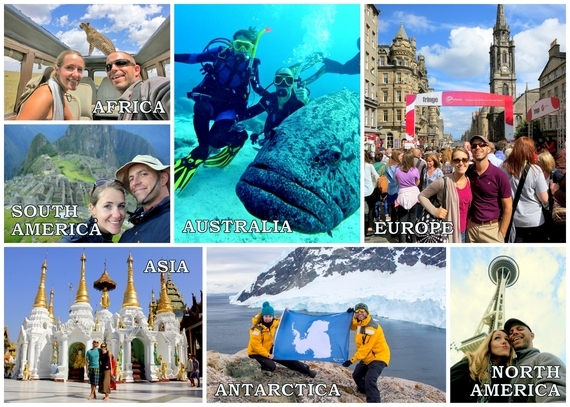 How does it feel to reach your seventh continent? At the beginning of our journey, we were in the southernmost city of Ushuaia, Argentina, and remember marveling at the Antarctic expedition ships in the harbor, trying to fathom what that trip would be like. We vowed to return someday. Four years later, reaching Antarctica feels like a true culmination of our travels. We had very high expectations for our Antarctica honeymoon -- which is a dangerous way to start any trip--but they were exceeded in every way imaginable! It is the most majestic continent on the planet and we are humbled to have explored even a sliver of it. What makes Antarctica such a special travel destination? There is just no place like it. Antarctica is 98% covered by ice with dramatic glaciers, frozen mountains, and towering icebergs. The raw beauty is so intense, it physically and emotionally stops you in your tracks. Beyond scientists, whalers, and a few intrepid explorers, there is no history of civilization, which has left the landscape pristine and the animals all the more inquisitive. Penguins walk right up to you and inspect your camera gear, seals do acrobatics around your kayak, and whales ride the waves of your expedition ship. From wildlife to landscape, "out-of-this world" is an under-statement. What was one Antarctic moment that blew you away? 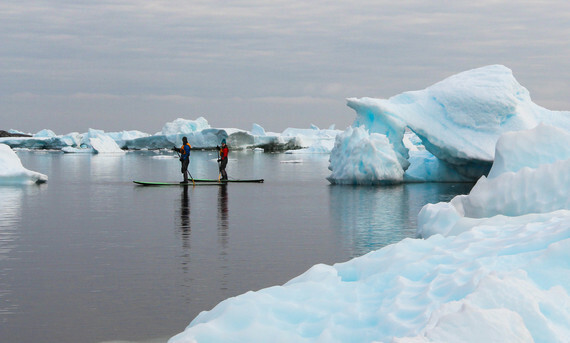 Standup paddleboarding around the icebergs of Pleneau Bay. At first SUP sounds like a crazy idea...balancing on a wobbly board over icy waters with mischievous leopard seals swimming nearby? Nuts. But with a dry-suit and a support zodiac, there is no real danger...just a total adrenaline rush. SUP Antarctica engages your senses and connects you to the extreme surroundings in an unforgettable way. What does it take to get to Antarctica? While it is possible to fly, to get the full Antarctic experience, take a boat from the tip of South America and cross the Drake Passage...just like the explorers before you. The Drake is said to be the world's most treacherous stretch of sea. It's where the Atlantic and Pacific collide with huge waves and violent winds for 500 miles, until you reach the Antarctic Peninsula. A spot on an expedition ship isn't cheap, but it's not nearly as expensive as one might think. 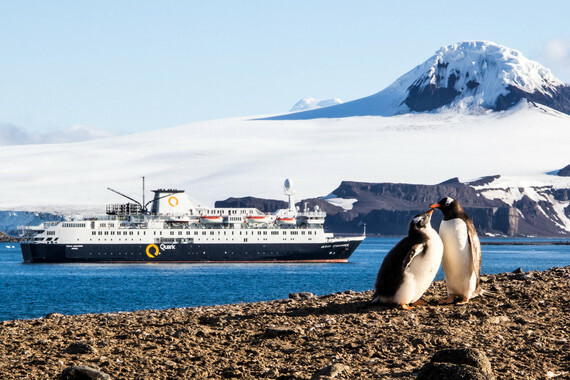 For 12 days of transportation, lodging, food, activities, spa, entertainment, and educational workshops, you can make Antarctica a reality for under $6k with Quark Expeditions, one of the most affordable (and actually quite luxurious) outfitters. 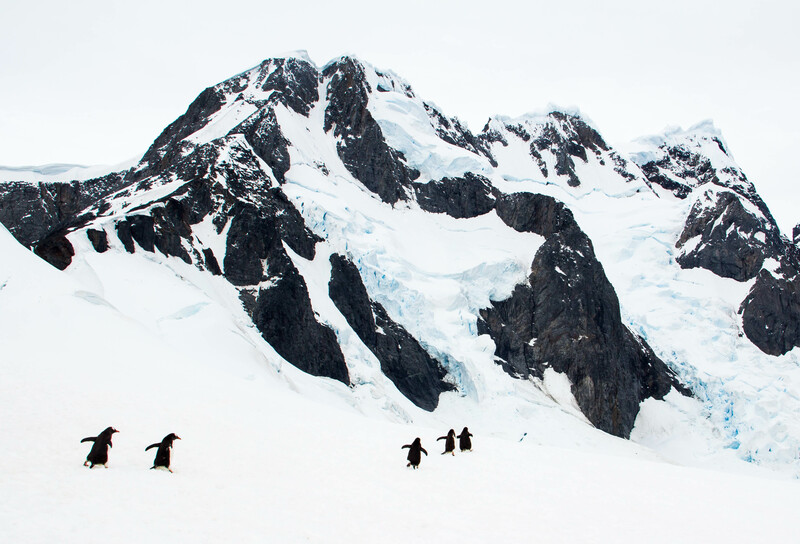 While that's more than your average vacation might cost, there is nothing average about an expedition to Antarctica. What are your tips for those considering a trip to the White Continent? • Don't wait. Antarctica is a fragile place, go while you can. • Support Sustainability. Every ship has to follow a certain level of sustainable practices to operate in Antarctica, but seek out the companies doing more to protect the environment, from their daily operations to giving back long-term. • Be adventurous! Zodiac cruising (the standard daily excursion) is fantastic but make sure your ship offers extra adventure activities, like SUP, kayaking, and cross-country skiing, and reserve in advance. Where is HoneyTrek heading next? We'll be spending spring in Mazatlan, Mexico, summer in Costa Rica and Nicaragua, fall road-tripping through Portugal and Spain, followed by honeymooning Bhutan, then...who knows? Now that we're obsessed with polar landscapes, we have our sights on Greenland and the Canadian High Arctic! Travel gives you memories, adventures, life-lessons, and friends that will be with you for the rest of your life. We didn't want to risk pushing that into the distant and unpredictable years of "retirement." There isn't a day that goes by that we don't think about a funny moment, beautiful place, interesting encounter, or insightful conversation from our travels. We have found a new way to live and be happy, and while everyday isn't perfect, it's always an adventure. Blakely is traveling around the world with her husband and recounting their misadventures on her travel website. Follow to get lost, thrilled, taught, scared, shocked and changed with them.